Welcome to the Copper nutrition section for 50 types of potatoes, each of which can be scaled by the amount in g, oz or typical portion sizes. Simply click on a link from the nutrition list below to answer the question how much Copper is found in potatoes? The list below gives the total Copper content in the 50 items from the general description 'potatoes'.These 50 types of potatoes range from Potatoes, microwaved, cooked, in skin, skin with salt through to Potatoes, mashed, dehydrated, granules without milk, dry form and are ranked by the content or amount per 100g. Using the list below for the 50 different potatoes nutrition entries in our database, the highest amount of Copper is found in Potatoes, microwaved, cooked, in skin, skin with salt which contains 0.882 mg of Copper per 100g. The lowest amount of Copper is in Potatoes, mashed, dehydrated, granules without milk, dry form which in 100g contains 0.102 mg of Copper. The median value of Copper is found in Potatoes, french fried, cottage-cut, salt not added in processing, frozen, as purchased which in 100g contains 0.141 mg of Copper. The average amount of Copper contained in 100g of potatoes, based on the list below is 0.27 mg of Copper. From the Copper content in potatoes list, click on a link to give a full nutrition breakdown which includes calories, protein, fat and carbs as well as Copper. Each potatoes item can be scaled by different amounts to adjust the amounts of Copper so that it is not just, for example, the values in 100g of Potatoes, microwaved, cooked, in skin, skin with salt. The item can be scaled by quantites in g, oz or typical serving sizes. 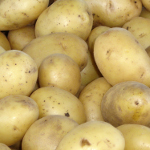 Copper contained in 100g of 'potatoes', click a link for different servings.